Luckily my mother-in-law warned me of an impending storm today (we might get a tornado tonight! ), so that was inspiration to get in the run I was procrastinating all morning. I had a great 4.5 mile run in about 38 mins and a balmy 18C temperature. We are having a heat wave this week and it was so nice to run in the warm weather, even if it was raining. In other news, I’m madly in love with these Healthy Strawberry Oat Squares. Crazy, in that I had to put them in the freezer immediately so I didn’t eat them all and I should probably be committed or better yet, in a straitjacket. Eric and I have been enjoying a square after dinner each night and we arm wrestled over the last square. 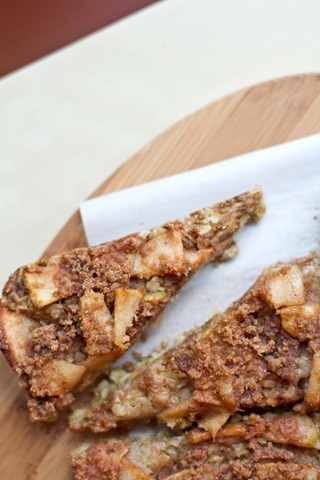 Ashley made the oat squares into a lovely apple variety, so I decided to follow suit and used her topping as a guide. I decided to make an apple streusel topping as well, adapting the topping from one of my favourite muffin recipes of all time. 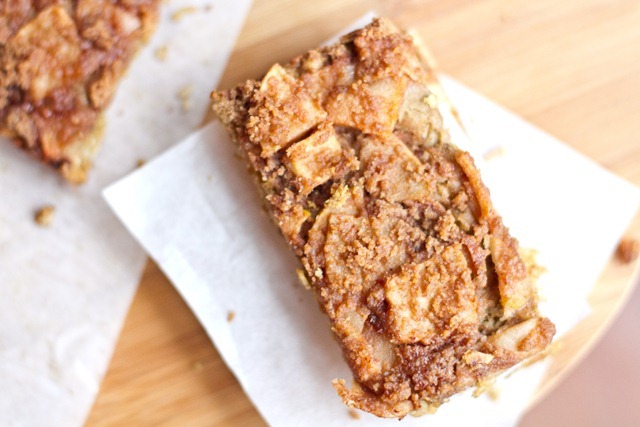 Adapted from Strawberry Oat Squares and pumpkin apple streusel muffins. Directions: Preheat oven to 350F. Line a square pan (I used a 9×9) with parchment paper and oil the sides of the pan and base. 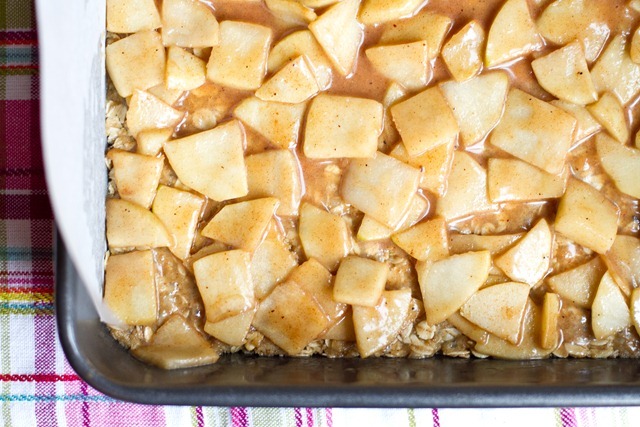 In a medium sized pot, add the apple mixture ingredients (chopped apples, Earth Balance, brown rice or maple syrup, spices). 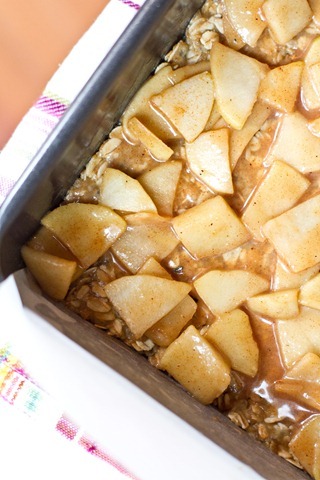 Heat over low, stirring frequently for about 10 minutes, until the apples soften and mixture thickens up. Add the wet mixture to the dry and mix well, using hands if necessary. 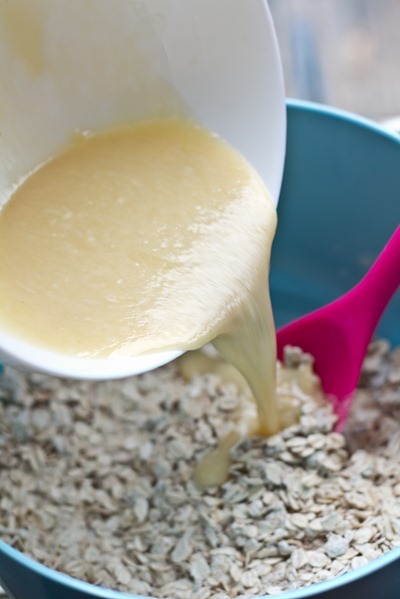 Set aside 1/2 cup of the oat base mixture if desired. Pour the oat mixture onto the square pan and press down with fingers. Use a pastry roller to smooth out if desired. 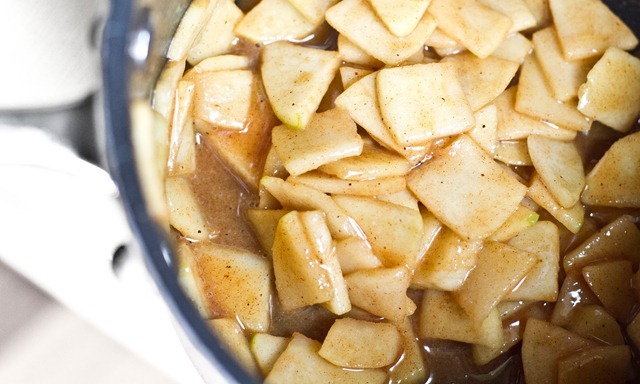 Pour on cooked apple mixture and smooth out. 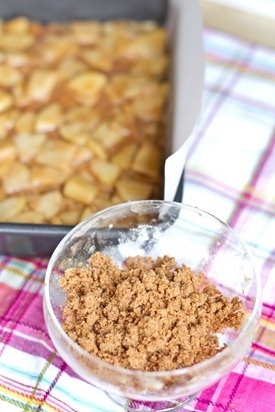 Make the apple streusel topping by mixing all ingredients together with a fork or fingers. Now sprinkle on the reserved 1/2 cup oat mixture and apple streusel topping and sprinkle over top. Bake at 350F for approximately 30 minutes. 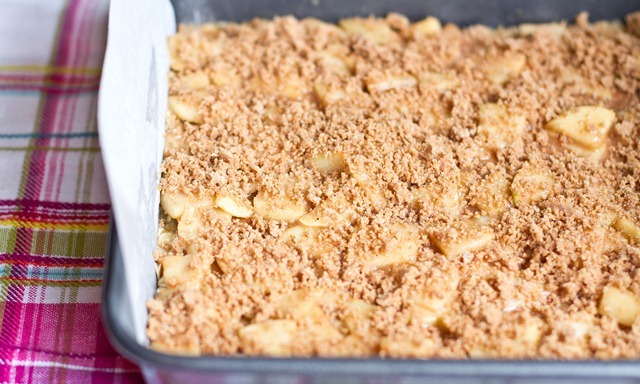 Allow to fully cool for at least 30-40 minutes before gently removing from pan. You can firm them up in the fridge before slicing into squares or bars. The bars also freeze very well (I place them into a container in the freezer). I ended up using three large Grannies when I decided that two wasn’t enough for the topping! 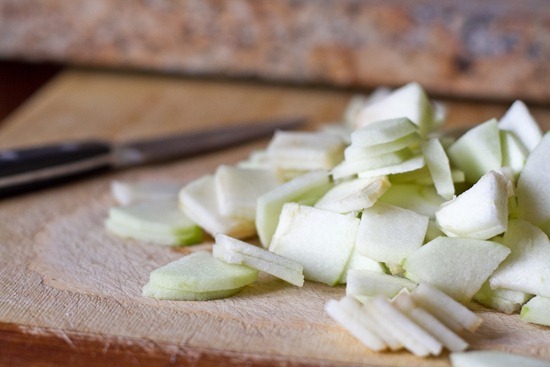 Peel the apples and slice, slice, slice and chop, chop, chop. 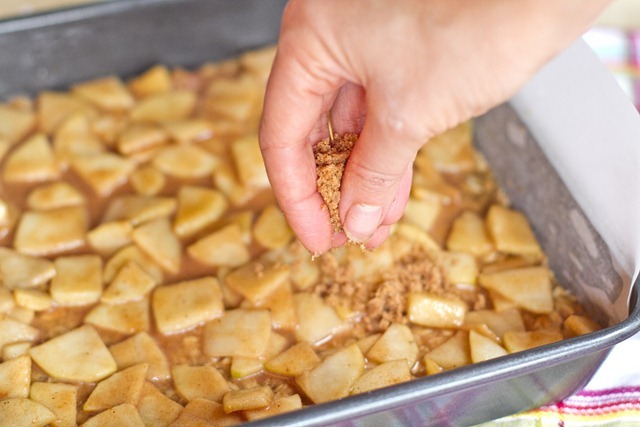 Make the apple mixture on the stove top. Admire the beauty before you. 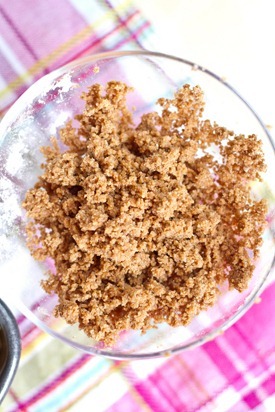 Make the cinnamon streusel topping. 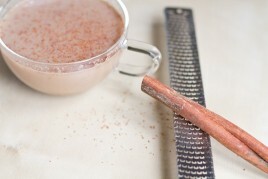 Freshly grated cinnamon on top, if desired. Bake for 30 minutes at 350F and then allow to cool for at least 30 minutes. You can also firm them up in the fridge before slicing as they will be crumbly. Delicious. Seasonal. Rustic. Not too sweet. 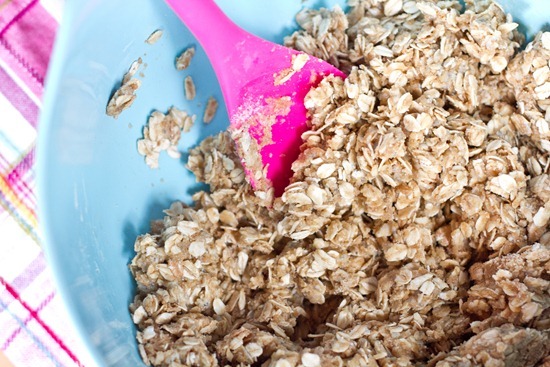 I forgot to reserve 1/2 cup of the oat mixture to sprinkle on top and I missed it. Next time, I would definitely do that again as it added a fun texture on top. They would also be delicious served with some vanilla ice cream or banana soft serve! I think I still prefer the strawberry jam variety, but it is a tough call. Other votes shall be placed tonight during Hockey Night in Canada. If you don’t hear from me tomorrow, the tornado came for my baked goods. You will come looking for me, right? I was totally drooling over my keyboard when Ash posted these. Now I’m just drooling more. I’d swallow that whole pan. YUM! I wish I could move into your kitchen. Everything you post lately makes my stomach growl. :) I love pretty much any combination of apples and oats, so I am sure that today’s dessert tastes divine. sounds like our weather too! i need to get one of those little rollers! I will warn you though, for a couple weeks you will be rolling everything in sight. ahhhh these look to die for! recently i have been eating the “nutrigrain like” bars from barbaras bakery (they are whole grain with no sugar added) an have been lobing how great they taste….but a homemade version would be soooo much better! thanks for the new recipe inspiration! Oh my gosh. Dare I say that the new version looks even better than the original? Blasphemy. These look phenomenal :) Hope the bad weather is not too awful. OH MY GOODNESS YOUR BAKED GOODS LOOK SO GOOD LATELY!! I am just in love with them all :) However, I do have one question…what do you do with all of them? Leftovers go to the freezer, gifts to friends and family, Hockey Night In Canada, Eric’s coworkers. I’ll come looking for your baked goods :P. I’ll have to be looking for you too if I want more ;). bahah I know where I stand. Wow! Tornadoes this time of year! I always have to eat the apple peelings too because I feel bad throwing them away! I eat them because I think they’re tasty! A tornado! That sounds exciting! I live in England and we just get strong winds-tornados are far more exciting! YOM! these are so adaptable and so BEAUTIFUL! They look lovely! Your photos are out of control lately..amazing :) Favorite photos are the vertical apple photo w/the blue background and the bars cooling on the wire rack. YUM. It is super windy here too — the whole house shakes when the wind blows! No tornado warnings here though — and I hope they stay away from you too! I made them with Raspberry jam the other night…I’m glad I freeze EVERYTHING because they’re still getting eaten super fast with only me around. Ice cream would be fantaaaaastic with this, I bet. [American] Thanksgiving dessert perhaps? I don’t know about where you are, but here in Niagara we just got a bit of rain and some wind, nothing crazy by any means! Those strawberry bars look so good! I never really like nutri-grain bars, but yours look amazing! Those look so good! When I saw Ashley’s yesterday, I just about drooled on the computer screen. We had really bad storms in Chicago this morning – no tornado and I’m still here!! How can you control yourself with such amazing things like these oat squares always in the house? Oh my, these look out of this world!! I hope the tornado doesn’t hit too hard. Pretty sure I would eat the whole pan before they made it to the freezer. Plus, I wouldn’t tell my husband about them… I am not good at sharing such amazing food! Good luck with the tornado warning. I don’t blame you one bit for being in love with those Strawberry Oat squares. YUM-O! Being from the midwest, I take tornadoes seriously…I hope you are okay!!! 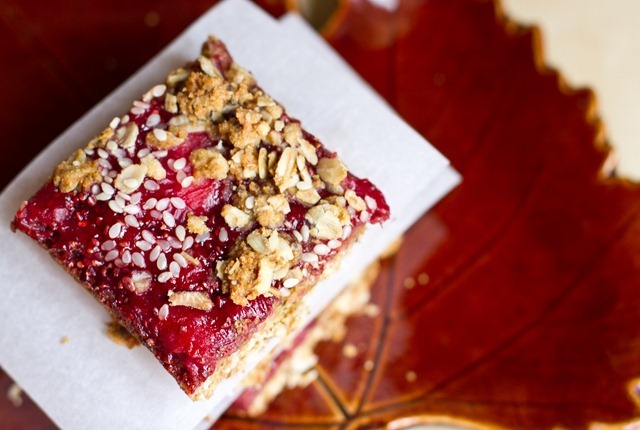 The strawberry oat squares are amazing! My hubby and I made them on Sunday and love them. Mmmm – I like apple even better than strawberry. :-) Thanks! I am constantly impressed by your baking skills, especially because I am more of a cook than a baker. Do you make up all of your recipes from scratch, or do you often borrow ideas from others, or adapt recipes that you find? A bit of both…whenever I an inspired by another recipe or adapt another recipe I always give it credit underneath the title. Those squares turned out beautifully! You are really a MASTER in the kitchen. If not the tornado, it would be me that came for your baked goods. They look amazing. I’m coveting your adorable little pastry roller! 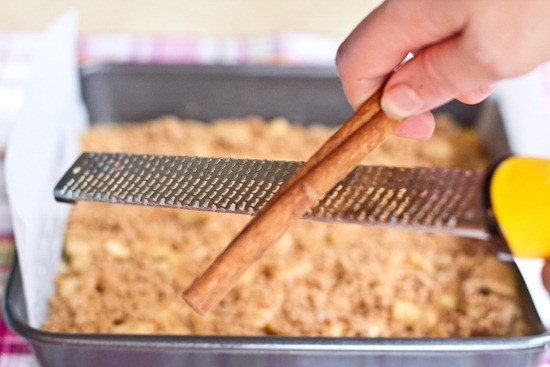 Apple struesel topping may be the BEST thing ever. I think I’d like the apple version even better than the strawberry!! I’d come save you…and your little baked goods too! 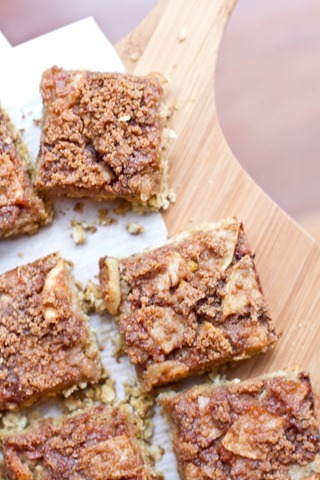 Mmm, streusel! These look amazing. 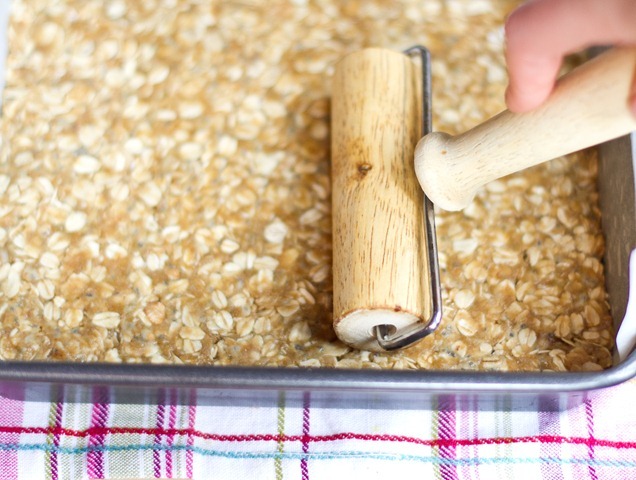 Love love love jam bars… would you just use your fingers to press it in if you didn’t have a roller? 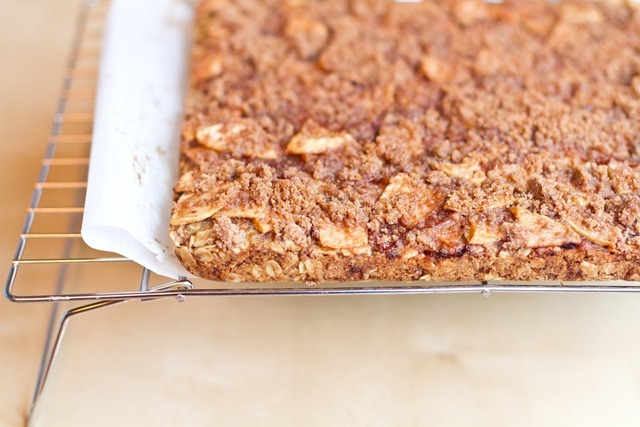 OMG those oatmeal squares look divine!! 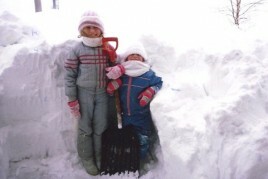 Your photos are great- I want to make this now! Who else thinks we need smell-o-vision ?! Wowza! Those look amazing. Your photos are also incredible. I’m so jealous you get to watch the games on Tuesday! We don’t have sportsnet or anything, so we only have Saturday games:( We live so close to the ACC that we actually hear the fog horn thingie when they score… but we don’t know what’s going on! So cruel haha. The tornado should head West and drop off baked goods to ME! Those bars look divine! Hope all goes well in tornado country! Those look amazing, I think making them with fresh raspberries would be so great! Good luck with the tornado! I seriously wish you could be my live-in baker. Looks super good, Ange! I like to see the fall fruits, I’m really in the fall spirit! Good luck tonight, avoid being too close to windows!! I am a huge fan of any apple treat! 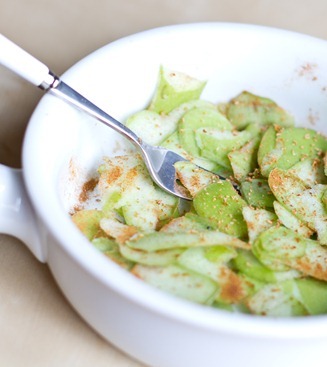 The apple slice looks amazing. 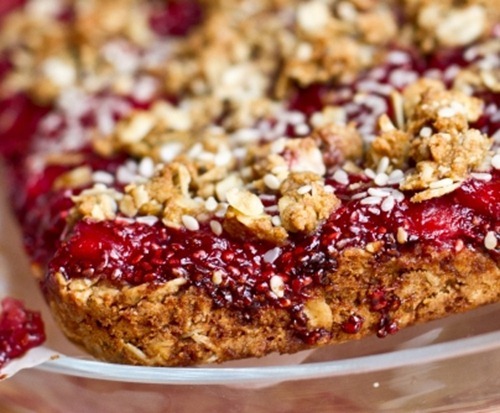 Do you think it is possible to make a vegan cheesecake slice? Sounds like there are storms all over the place today. I’m kind of jealous…I love storms. I’ll keep my fingers crossed for you for no tornadoes though! Have a great night Angela! You’re amazing! I wish I could bake-and-snap as well as you can! Looks like a must try!! just lovely! 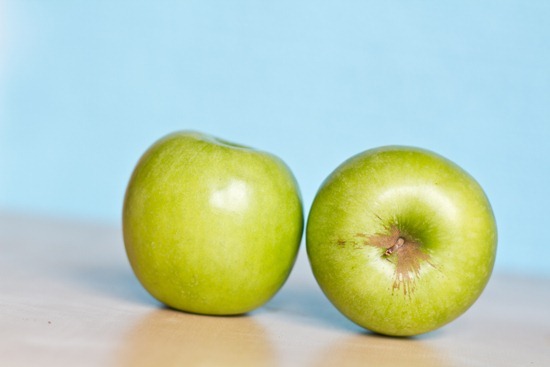 love apples in all ways…but a crisp is my favorite. These look amazing, as usual :) Love that roller. Good luck with the wild weather! I am such an American I couldnt tell you what 18c is. But what I can tell you…is that you’re hella fast, lady! WOW!! You are bookin’ it! Nice speed!!! Looks incredible. I love fall desserts and especially anything involving streusel. You constantly amaze me with your creativity. Thanks for the cheer and joy you bring into so many of our lives! Those all look delicious, I love adaptable recipes like that! I made these with fresh raspberries and LOVE them! They are crazy good ;-) Thanks for the great recipe!! When i first saw you post the strawberry ones i immediately was reminded of the apple bars that my mom would make as i was a kid but unfortunately they have cream cheese in them:(:( I made these bars with a cherry filling (for my roommates boyfriend’s party) and they were good but i think that apples would be even better!! I made the strawberry bars last night and they are to die for! I used Spelt flour for the base ant it turned out great. Your right, I need to freeze them or I will be eating the rest tonight :) Im going to make the apple burritos this weekend. Thanks for all the great recipes! Made these today and they were really good! 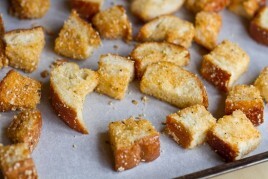 Also tried 2 of your cracker recipes – even the kiddo’s ate them up! Thanks for the great recipes! Thanks for a fabulous recipe Angela! 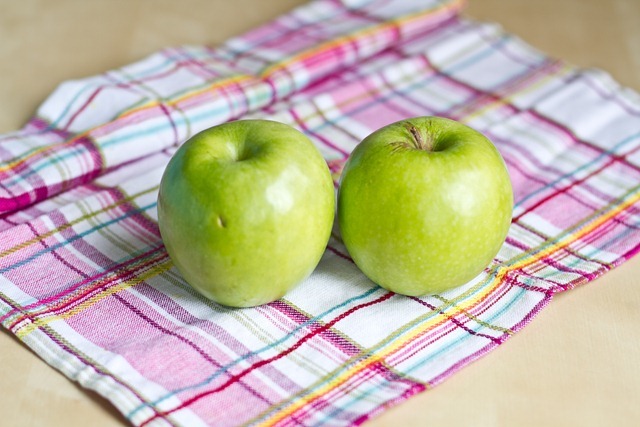 I made these last night and we added cranberries to the apple mixture…perfect touch of tartness! I’ve been following your blog for awhile now and love your recipes and stories ~ thanks for the great recipes and good luck with the Project Food Blog! Is there a gluten free version or can I just swap out with oat flour? 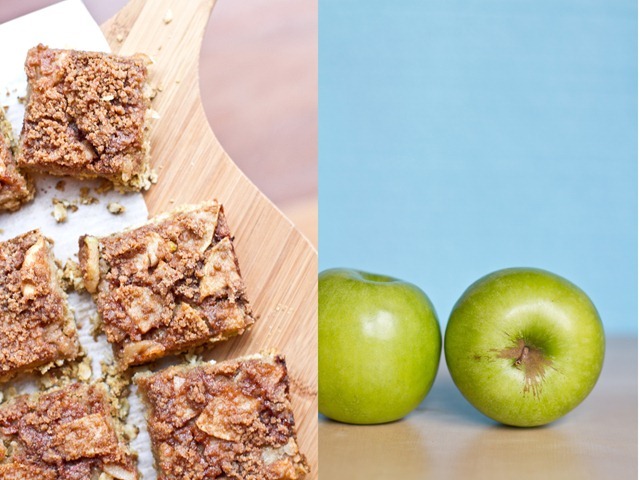 Love your recipes Angela, you are helping us get healthy!! Did you try it? How did it come out? I realize this post was published over 3 years ago but I find the recipe soo tempting to make, that I just had to ask you something. Can I substitute coconut oil or anything else for Earth Balance / butter? Thank you for the wonderful recipe! 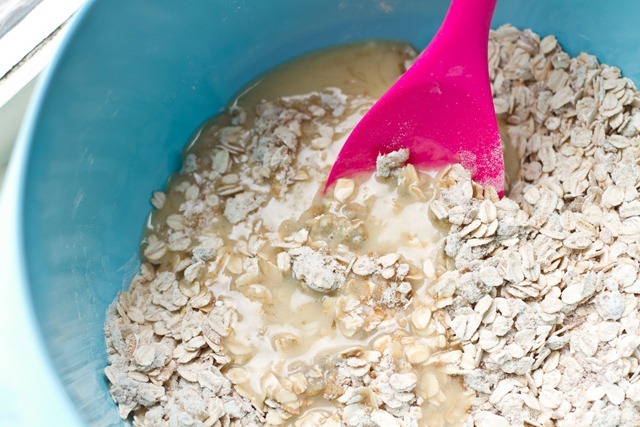 I am a great fan of oatmeal in cookies and muffins and I’m sure I’ll just love this one! I just wanted to say I made this .. cake (to me everything’s called a cake :)) with the tweaks I mentioned above: cows milk, a real egg, honey instead of maple syrup and coconut oil whenever the recipe called for butter/earth balance. It turned out AMAZING and my family loved it, and so did I! I make alot of your recipes – and they aways turn out SO good. 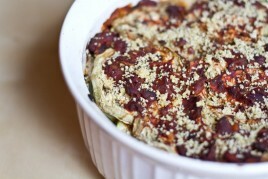 Recently I am on a gluten free diet (& have been trying alot of your gluten free recipes). 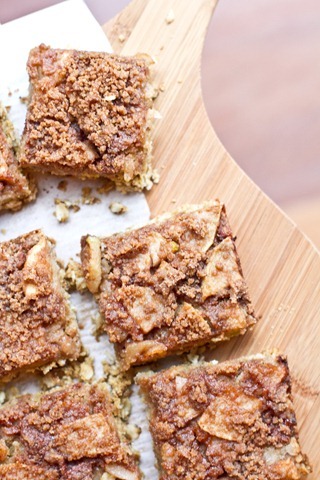 Just wondering if these apple streusel oat squares have a way of becoming gluten free? 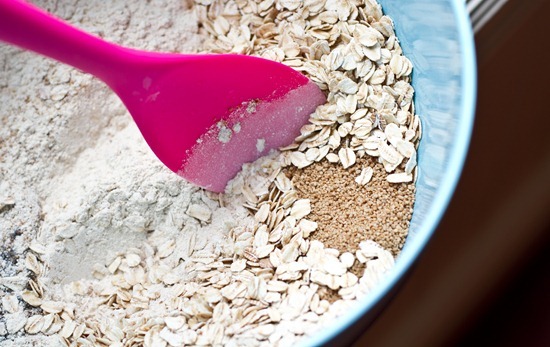 Could I sub the kamut flour with another? If so what would be best? I have a galore of gf flours in my cupoard. I just tried doing oat flour on thanksgiving morning and they turned out wonderful! Thank you so much! :) The whole family enjoyed them!! I made these tonight as an edible gift for my vegan boss who also has a nut allergy. Amazing! They taste great and I can’t wait to share them with her soon! You are my hero!! I’m so glad I started following you before you become famous. It’s neat to have seen your journey.